This is finally the way an end-user should set his preferred theme, since currently either the command line was needed (defaults write) or only per-application setting was possible. The module uses themes for GSTheme and they can be created with thematic. It displays a short description, the author, if available the version, the icon and a small theme preview. Since it would be almost impossible to do a preview in a subview, each bundle can carry an image of its preview. The user can "Apply" the theme which means essentially to set the selected theme to the SystemPreferences application as a sort of preview or to Save, which writes the default permanently. In the attached screenshot, you can see that the "ThinkDark" theme is applied temporarily and that the user is inspecting the Neos theme. The rest of the system however still runs the standard theme. Thanks to the dynamic loading capabilities of GSTheme, after saving the theme all application get the new theme immediately. 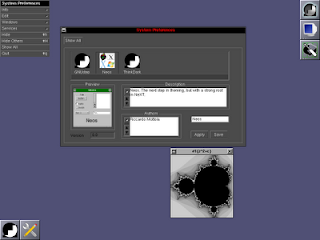 The Themes module supersedes the Color Schemes control panel which is thus now no longer built and installed by default, although it remains available. Up-to-date themes are present in the GAP CVS repository, they will be re-released soon.